In the future, things will be very different, according to projections from the Global Cities Institute. In fact, over the next 80 years or so, some cities will literally 10x or 20x in size – turning into giant megacities that have comparable populations to entire countries like modern-day Germany, France, or the United Kingdom. The most interesting part? None of these cities will be in the Americas, Europe, China, or Australia. 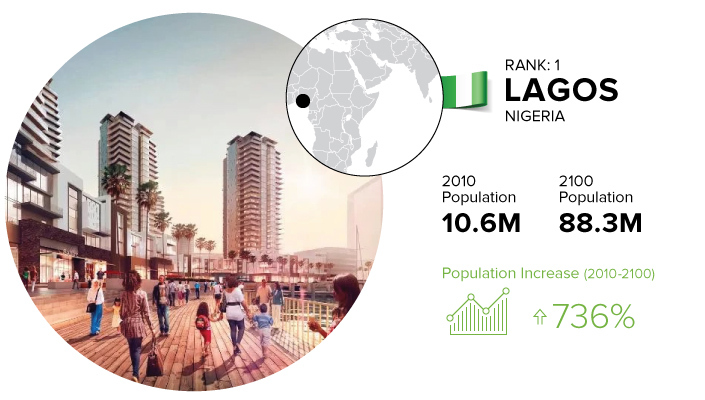 Lagos is already one of the biggest metropolises in Africa, and we previously noted that it was one of the fastest growing cities in the world. In fact, it’s growing so fast, that no one knows how big it actually is. The U.N estimated it had 11.2 million people in 2011, and the year after The New York Times said it had at least 21 million inhabitants. In any case, this Nigerian metropolis is growing like a weed, and the Global Cities Institute estimates that the city’s population will hit the 88.3 million mark by 2100 to make it the biggest city in the world. The city is already a center of West African trade and finance – but Lagos has ambitious plans to up the ante even further. Right now, the city is building Eko Atlantic, a massive new residential and commercial development that is being pitched as the “Manhattan of Nigeria”. It’s just off of Victoria Island, and it is being built on reclaimed land with special measures in place to prevent flooding from global warming. When people think of the DRC, sprawling metropolises generally aren’t the first things that come to mind. But Kinshasa, once the site of humble fishing villages, has already likely passed Paris as the largest French-speaking city in the world. And it’s getting bigger – by 2100, it’s projected to be the world’s second largest city overall. How Kinshasa develops will certainly be interesting. As it stands, approximately 60% of the 17 million people living there by 2025 will be younger than 18 years old. How the city deals with education will be paramount to the city’s future progression. Have you heard of Dar Es Salaam, the Tanzanian megacity that will hold 73.7 million inhabitants in 2100? It’s not on a lot of people’s radars, but its population will explode 1,588% to become the third largest city in Africa, and in the world. Interestingly, East Africa will be home to many of the world’s biggest cities in the future – and many will be seemingly popping up out of nowhere. Consider Blantyre City, Lilongwe, and Lusaka, for example. Most Westerners will not likely have heard of these places, but these centers in Malawi and Zambia will each hold over 35 million people. Finally, the last city to round out the top four is Mumbai, which is already one of the world’s biggest megacities with over 20 million people. As the entertainment capital of India, it will be interesting to see how Mumbai evolves – and how it ends up comparing to other Indian megacities like Delhi and Kolkata, which each will hold over 50 million residents themselves.